July 22, 2013 By Tina M 40 Comments This post may contain affiliate links. Read my disclosure policy here. This week’s update: We just got back from a fun family reunion and it was the perfect break for us! My toddler played with her cousin who just happens to be the only other toddler that she plays with so well, so it was nice for me that she had a little distraction. And it was so very nice of grandma and grandpa to take the grandkids while my husband and I got some Four-Wheelin’ Time. The downside to the vacation: Not much, other than eating too many snacks and coming to the realization that I have a serious sugar addiction. Okay, here we go…so maybe this blog is letting you all get to know me a little too well. It’s time for another confession. I have had a sweet tooth (my “nice” term for sugar addiction) for…well for as long as I can remember. I’ve always been jealous of those people who eat a few pieces of candy and then their body tells them that they’ve had enough and they can’t go any further. I didn’t think those kind of people exist, but one of them happens to be a good friend of mine, and the other is my sister-in-law. Like they eat a HALF of a candy bar and they just can’t handle anymore. My body seems to have a much higher tolerance for sugar. I can eat a couple of peanut butter cups, followed by a mouthful of swedish fish, and then starburst? Why not. And my body just tells me it’s happy. I’ve also always been jealous of those people who use running to handle their stress levels. Why? Because throwing my running clothes on is the last thing I feel like doing when I am stressed. Usually the solution has been to stuff my face with some chocolate and move on with my day. But it’s time to stop. Not because I’m fat or obese or anything (although I do have some postpartum jiggles to get rid of)…but because my dad just landed himself in the E.R. for like the millionth time and I don’t want that kind of future. My dad is a diabetic. He’s already had one of his toes removed, he can’t really walk anymore, and he’s currently in an assisted living center (on dialysis) at the age of 50-somethin’. I’ve worked at assisted living centers before. And I know that he is way too young to be in a care center. Ever since I graduated from high school I have prepared myself mentally to hear the news that my dad has passed away. I don’t know that I can ever say that I am ready for that news, but I know it will probably come sooner than I would like. And it will probably happen before my children get to know him much. I’m getting off track here. I don’t want my children to go through the stress of wondering when their mom might die all because she couldn’t get a grip on her sugar addiction and poor eating habits. So here’s the deal: I’m giving up sweets for a time. And I need you all to know this because once this is published I have to hold myself more accountable. And if any of you would like to join me, I would LOVE for you to! I will send weekly emails to see how you are doing, as well as share any recipes I’ve been using. 1. NO SWEETS. I will also be going off white flour, but you can modify as you need. No sweets means no candy, desserts or beverages that contain sugar, high fructose corn syrup, or ANY artificial sweeteners (they are worse for you than sugar–look it up). 2. FREE DAY. I like to give myself a free day so that if a holiday or social event comes up during the week, I don’t have to be boring and say, “I’m on a diet.” That’s just not fun for anybody. THIS IS NOT A BINGE DAY. One treat. Choose wisely my friend. For some sugar addicts (like my sister), having a free day sends you into relapse. If this is you, omit the free day. For me personally, free days give me added motivation because I don’t feel like I’m never going to eat yummy treats again. I just have to wait one week. This also prepares me for life after the diet when I will have to re-learn moderation. 3. INCREASE natural and nutrient-dense foods. To help me with my sugar cravings, my first week will be majorly focused on putting the “right” stuff in my body. As part of this, I have joined the one week REAL FOOD CHALLENGE along with 8 other bloggers over at Mary’s Kitchen. I have modified this to fit my “life-with-a-newborn” lifestyle (I’m not about to make my own mayonnaise). But what this basically means is I will be cutting out processed foods and replacing them with homemade wherever possible. I will also be increasing my fruits and vegetables and rockin’ my mornings with green smoothies. 4. REEVALUTATE in ONE MONTH: School for us starts in exactly one month. So I will do this until August 22. If at that time I still feel like I am having sugar cravings all of the time, then I will continue for another month. Once I feel like I have control and can recognize that most things just aren’t “worth it,” then I will allow myself back into the real world and practice moderation. Drink lots of water. Many times dehydration will mask itself as a sugar craving, when really what your body needs is water. lots of sugar in your diet also leads to overeating, which leads to being fat and unhealthy. Drink, drink, drink! You can even drink fruit water if you want to encourage drinking more water in a day. because it is natural and safe if it’s swallowed. Eat Fruit. Apples and grapes are my favorite to eat when I am having crazy sugar cravings. I also like to eat Stretch Island 100% Fruit Leather, as well as Clif Kids Organic Fruit Twists. They are 100% fruit and contain no added sugars. You can get them at Costco if you have a membership. EXERCISE: Exercising always makes me crave healthier foods. If your cravings are feeling out of control, go for a run or participate in your favorite form of exercise. Eat a healthy snack when you are finished. EAT REGULARLY. This will help keep your blood sugar stable and lesson your sugar cravings. 1. 100% Juice. It’s not good to fill your body with a bunch of juice, but if you just can’t get past the cravings, then make sure it’s 100% all fruit juice. 2. Make some healthy sugar-free treats. Thanks to Pinterest and the blogging world there are tons of recipes out there. Try to find some that use Agave nector, Stevia or xylitol. If you don’t know about either of these two ingredients, look them up. They are plant-based and better for you. And there are some awesome recipes out there that use them instead of sugar. I’ll share a granola bar bites recipe I used today using Agave, and if you want to be part of the challenge I can email you my sister’s TASTY recipe for homemade chocolate truffles that she made with stevia and xylitol. Alright! Let the FAMINE begin! 🙂 Anyone else out there with a serious sugar addiction? Need something for your weak moments? 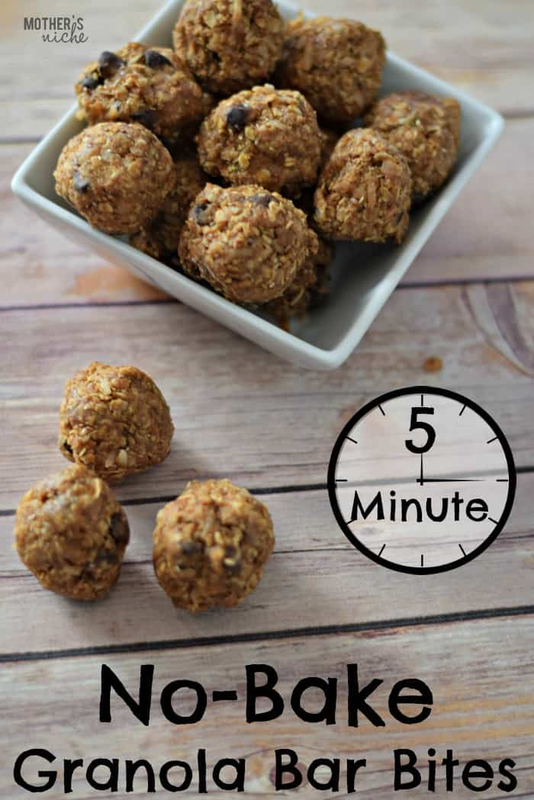 I LOVE this granola bar bites recipe. It’s sweetened with honey (you could also use agave), and you can swap out the chocolate chips for raisins, etc. It is so dang good and it has a lot of good stuff in it. The ground chia/flax seed are great for energy and protein too! You can do it! It will be hard and you might go through a bit of withdrawal, but it will all be worth it! Hi nice post. I don’t want this to seem nagative I agree w most of what you recomend I too have a sugar addiction which at one point I managed by eating healthy. I just want to point out that agave is not low sugar it is 100 percent fructose and is harmful to diabatics in large quantities even though it is zero on the glycemic index. Use moderatly if it all. I’m like your sister. Some things will just lead to bingeing for me. I found out through an elimination diet that a lot of sugar or high glycemic foods will aggravate my eczema. I’ve decided to limit those things to special occasions and just be prepared for the outcome. I love your blog and I hope you keep us updated on your progress. I’m going to join you in your efforts. I’m addicted as well. To tell you the truth, the thought of going off sugar makes my hands sweat. It’s terrifying….which only tells me I’m making the right decision. Here we go….gulp. Wow! What a small world. I was diagnosed with celiac in 2006 and while it is easier to find things, it can still be overwhelming. I love most things made by Udis and Glutino. And Tinkyada is the best pasta in my opinion. Hodgson Mill also makes a good pizza crust mix. Good luck! Thank you so much Andrea! It is such a waste of money to buy a brand that is gross, so I appreciate the tips! Thanks for stopping by Sarah! I too once thought Splenda was a good alternative. Good luck! If you have a relapse, I’m always here for support, lol. 🙂 And if you try any of the Spry gums, the fruit flavored one tastes like juicy fruit! Just be prepared for the flavoring not to last as long as normal gums. Great ideas! But can I add a hint? Agave is higher in fructose (ie. the worst kind of sugar) than high fructose corn syrup. Yep. I was shocked too. Soon everyone will realise that agave is NOT a healthy alternative to refined sugar. Stevia is good and glucose syrup is better too. Don’t fall into the agave trap- you are better off eating white sugar! Hello! Thanks for this! I’ll be saving it! I’m really trying to eat better (it’s hard when you live with your older parents that are stuck in their ways and are eating all of the things you love or are bringing home your favorite donuts). My dad is diabetic and I’m close to being pre-diabetic so any tips are welcomed! The reason I replied to your comment is that I’ve heard a lot about the agave and wanted to look into it–however, the link you posted isn’t working : ( Thanks so much! You do realise this article is being read by diabetics? The comment…until I get diabetes and die’ is rediculous, and not very nice for a diabetic to read. And just so you know eating sugar does not cause diabetes! Thanks Sharon! Nothing in this post was meant to be insensitive, I’m sorry if it came across that way. And I realize that sugar does not cause diabetes, but it can damage your body’s insulin management and cause weight gain, which would contribute to diabetes. Since diabetes runs in my family, poor diet does put me at greater risk, and feeding my sweet tooth makes my risk higher. Thanks for stopping by! I really need to cut out sugar too… I am the addict type too that once I start, I can’t stop… esp w chocolate. I am in the same boat with all of you. I looooove pastries and gourmet desserts. I also love bread, butter, oh geez it’s terrible. I recently signed up to my fitness pal on my iPad and so far I’m on the right track. Also substitute all the fatty things in typical desserts like applesauce over sugar, bananas over butter or some other things. You can look it up on the internet and there’s a lot of tips for substitutions, good luck everyone! Just “ran” across this blog. I know exactly where you are coming from. My father passed away at 43 because he wasn’t going to change his diet, regardless of what the doctors told him.I have recently lost over 20 pounds changing my diet and adding exercise and yoga. I refuse to follow his poor choices. I use myfitnesspal as a great resource to track my intake and weight. It’s really great that you are making sure you eat right. You are giving your family a wonderful gift. My doc put me on a very low carb diet, which means sugar is out, as are starches, grains. I can eat 9 gms of carbs per meal, 3 meals a day. I thought she was trying to kill me. I honestly thought I couldn’t do it. But you know what? I’m still on it almost 6 months now, and it not only had me losing 15 pounds, it cut out my knee pain, heartburn, bloating. Asthma almost gone )unless I’m stressed). My sugars went from pre-diabetic to normal. Blood pressure down. Triglycerides WAY down. ICholesterol down. I didn’t know I felt bad until I felt so much better. It’s worth it to cut out sugar, and grains (if you are sensitive to them, not necessarily celiac). Well I have come to terms that I am A SUGAR ADDICT big time. I binge on sugary things so Im going to seriously give this a shot.. Wish me luck as I know your post is almost a year old.. I had gone sugar free for a month last year and felt AMAZING…then i treated myself with some ice cream to congratulate myself. This was a terrible idea as i totallt relapsed and haven’t been able to give it up again since. I’m determined to give it another go and succeed until my addiction is gone. Reading this gave me another little push. So thanks 🙂 Going sugar free is the best gift i can give myself, wish me luck! Good luck Amber! Im actually starting again tomorrow as i have not been doing great lately! Any tips now that you’ve tried and gone through it? Every time I try I turn into a raging B! And trust me, I pound down the sugar, so I need a solution! Can you use honey w/ your granola bites instead of agave? Just revisiting your post after pinning it almost a year ago. I don’t know what it is about sugar that has such a hold over me. I wish there was a pill I could take that would make sugar taste disgusting to me. i feel like every morning I wake up with a brand new plan about how I’m not going to eat sugar and usually by the end of the day I’ve failed miserably. So frustrating! I just found out, between lab tests that my doctor ordered, and research that I did, that I’m severely allergic to sugars, as well as it causing numerous health issues that are just painful and unbelievable. I’m kicking the sugar habit because I don’t want to be in pain anymore. I apologize to anyone who is diabetic or if I’m offending anyone; that isn’t my intent at all. I’m simply saying that this is something I absolutely have to do for myself because life is worth more than the blasted sweets I’ve been shoving down my throat. I’m a stress eater, and sweets and wrong carbs are my “go to” when stressed; with 157 pounds to lose now, there is no turning back–it’s time to get myself on the path to improved health and reducing the stressors that make want to eat like a madwoman! I just came across your blog post on Pinterest. I feel like this is 100% what I’ve been dealing with for the last month or so. I am totally a sugar addict. I am also a stress eater so trying to avoid sugar is a battle. I have two active, young boys that bring stress (and fun moments) to our lives on a daily. Thanks for the great tips and the recipe. Can’t wait to try it out. So glad I cam across your post! Just wanted to tell you that you can do it! I just did this myself and I had the worst sugar addiction for years. Tips I can give you are first, If you don’t already eat eggs for breakfast start now, this is the biggest change I made that helped me. I had been having cereal for years because I loooove cereal, but I new I had to make a change if I wanted to get healthy. I also have lost 11 lbs since January 23rd so that’s another huge blessing. I noticed after making that change and also eating protein with every meal the sugar cravings got less and less. It made it so much easier to eat healthy. Eat lots of fruit veggies and almonds for snacks. Hope this helps anyone who reads this. I am a sugar addict as well. I have been on and off sugar many times. It’s what addicts do right? Can seem kind of hopeless when you do so good and then fall right back into old habits, but worse each time. My greatest victories come when I get mentally prepared, when I find some replacements for sugar and keep them on hand (i.e. raisins, 100% fruit leather, fruit). I don’t set long goals for how long I will be sugar free. Sometimes I take it hour by hour until I can go day by day and then week by week. I start out by telling myself when i wake up that I chose not to have sugar at least until after lunch. Then if I make it that long I usually will make a new goal. I find I have better self control this way and find myself getting stronger and stronger with each victory. Unfortunately, my downfall comes with rewarding myself with a free day. But the important thing for any addict to remember is to get up each time we fall. Thanks for the tips and ideas. I would also like to add that freeze-dried fruit is as awesome as candy, lasts years in the pantry, and is nothing but pure fruit. its great to take along and snack on without too much juice getting on your hands. Also homemade chips are the best and help keep you from buying a cheap but quite processed bag of them.